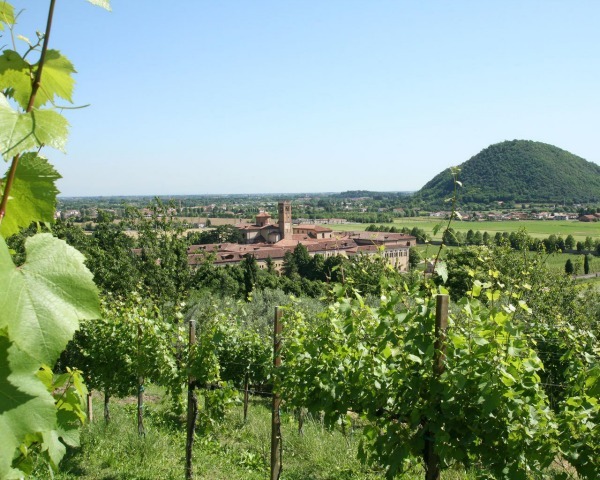 word that will soon become familiar should you choose to visit the Euganean Hills, a stone’s throw from Venice but nowhere near as well-known as its world-famous neighbour. Benessere, or ‘wellbeing’, is exactly what this Northern Italian area engenders in its visitors. This word appears everywhere; on street hoardings, passing vans and on hotel signs, nowhere more so than in the main town of Abano Terme, situated between Venice and the beautiful city of Padua. One of the main spa towns in Italy, Abano, famous since Roman times for its fango (mud) applications, thalassotherapy and a whole range of other complementary treatments, has it all: stunning surrounding countryside, luxury hotels offering every treatment and pampering known to humankind and a richness of art and culture that can only be Italy. The Euganean Hills, volcanic in origin (don’t worry, long since extinct) and formed about 35 million years ago, are now a regional park, with picturesque hill towns, fabulous Venetian villas, and so many wonderful restaurants you regret only having one stomach! 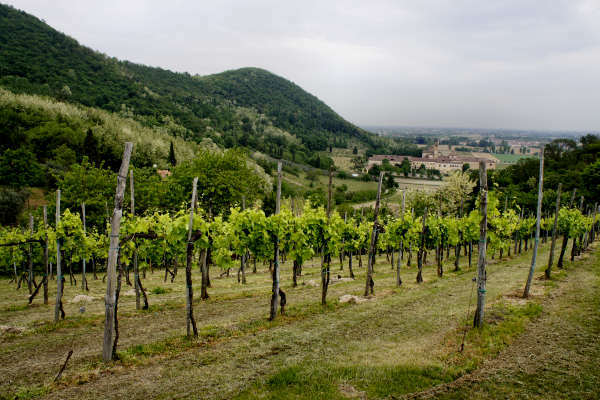 Among the hills that make up the Colli Euganei there are numerous vineyards, producing soft mellow reds and crispy whites, often with a touch of fizz. Here you will find prosecco in abundance. Often called the Italian champagne, this dry sparkling wine is the perfect aperitivo and, for my money, vineyards ahead of champagne for a fraction of the price. For walkers and nature lovers, this area is a joy. There are a number of itineraries, some gentle, others a little more strenuous, which take you along the delightful hill paths where round every corner there is a little surprise. A folly here, a clump of butterfly-encrusted wild flowers there and always the overwhelming sense of tranquillity that is truly benessere. There are also several championship golf courses in the area, usually combined with fitness and beauty centres for the less actively inclined. History seeps out every crack and crevice in the Colli Euganei. 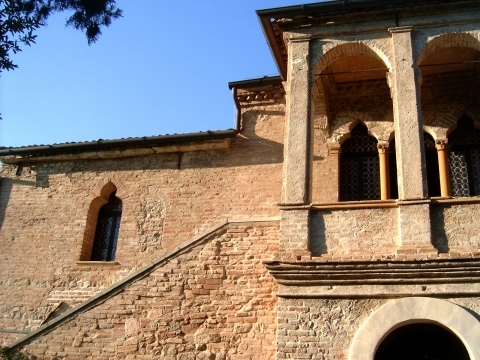 Arquà Petrarca, where the poet Petrarch spent the last years of his life, nestles in stunning countryside, so unspoiled you can imagine the views being little different from his last glimpses of them in 1374. Plan a visit in August or early September and enjoy an evening of opera at the open-air amphitheatre in Verona. Alternatively, tap into the local culture and visit one of the many sagre (traditional festivals and fairs) that take place in almost every hill town during the summer months. Our favourite is the festival of San Bartolomeo, held in Monterosso. Here, the local pasta called bigoli is handmade in vast quantities in massive tented constructions in the village square and served with ragù sauce, freshly barbecued meats and the tasty soft local salami called soppressa. Only in Italy can a tiny local village cater for hundreds of people at a time and computerise their orders for maximum speed and efficiency. Italians do not like to be kept waiting for their food. Take a trip along the Brenta Canal and visit the numerous Palladian Villas dotted along its banks. Such trips often culminate at the Grand Canal in Venice in the early evening, with your boat threading its way between the many gondolas and other craft that inhabit this magical stretch of water. This part of Italy has everything to offer. Venice, Verona, Vicenza, Padua and Bologna are all within an hour’s travelling distance and all well served by public transport. The area also has numerous airports with regular flights into Venice, Treviso, Verona and Bologna. Around here there is everything we love: fabulous food, stunning countryside, friendly, welcoming locals and art and culture that feed your very soul. Property is still reasonably priced, ranging from rustic to ultra-modern. The traditional houses of the Colli Euganei were originally built by farmers as country homes, with typical façades of exposed stone. Now, they have become desirable bolt holes for those seeking peace and tranquillity away from the stresses of urban life. Sitting under a pergola heavy with grapes, drinking in not only the production of the fruit from the previous year, but also the silence of the hills, creates lasting memories. Rustic houses, completely restored, start at €200,000 depending on the size and the extent of the surrounding land (vineyards, orchards, woods). Unrestored properties start at €140,000 depending on the size and the amount of restoration required. Occasionally wine-producing farms come on the market. There is a wide variety of other types of property also available. New apartments start at around €200,000 for a one-bedroom flat and, deep in the countryside, it is possible to find former working farms with out-buildings, ripe for conversion for the holiday rental market. This type of enterprise is relatively undeveloped in this area and offers great potential for buyers looking to capitalise on their investments. To know more about the area do not miss our dedicated feature Circular Walks Round Conical Hills: Exploring the Euganean Hills.